I am very frequently getting PM's regarding these topics. Figured I would post this over here. Offset is a measure of how far the mounting face (surface that touches the brake rotor) is from the centerline of the wheel. When you want to run a wider wheel with the same backspacing, the inner edge of the wheel will come closer to your suspension, eventually hitting the frame, control arms, coilovers or bodywork. To avoid this, wider wheels are made with lower (more negative) offsets. The side effect of this is the wheels "poke" out more. 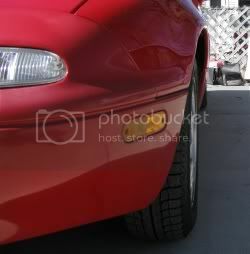 This "poke" makes the car look better by getting rid of the wheel gap almost all stock vehicles have. 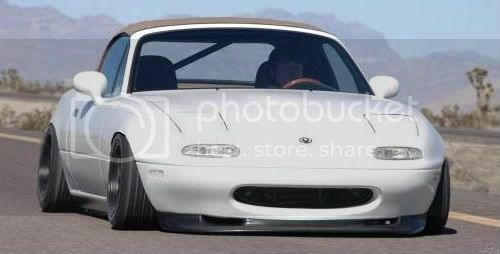 We try to take this a step further by stretching tires and running offsets so low that the wheel lip actually extends beyond the bodywork, while the tire tucks into the body. always get more negative spacing with spacers -but you wanna be close -however if they are too negative (sticking out too far) it will be difficult to get them back in -if not impossible. -typically would require machining and cannot be done on most wheels without a huge compromise in strength = unsafe. Anyway hope this helps some of you. IMO, no thread on this subject is complete without a link to http://www.wheelweights.net/ . Should also include the JimLab Wheel Calculator (for FDs). Please update your original post to include all the subsequent contributions of value. When you want to run a wider wheel with the same backspacing, the inner edge of the wheel will come closer to your suspension, eventually hitting the frame, control arms, coilovers or bodywork. I know Andrew knows what he is talking about but there is a brain fart in there. Running a wider wheel with the same OFFSET will bring the inner edge of the wheel closer to your suspension and possible causing clearance issues. Using backspacing to calculate the ideal wheel fitment off of a test wheel can be misleading if you don't pay attention to the numbers. I just measured 2 wheels in my garage as an actual example. The first is the stock gxl 15x6" wheel which is stamped +40. Edge to edge this wheel actually measures 7" wide and has a measured BS of 5.110". Now the misleading part that no one tells you when you are calulating the ideal offset is that you have to take into account the thickness if the wheel lips which are usually very close to .500" on each side. convert offset to inches: 40mm divided by 25.4 =1.58"
Why doesn't the math add up to what I physically measured the BS to be? Because we didn't account for the lip of the wheel which is roughly .5"
4.58" + .5" = 5.08"BS which is very close to what I measured to be 5.110". The reverse of this can be used to calculate the offset from BS. Here is the scenario. Using the above wheel as my test wheel I will try and figure out the ideal offset for a wider wheel to use on the front of an fc. My car is in storage and I haven't looked at the fitment in a while so THIS IS ALL SPECULATION. looking at the stock 15x6 wheel with 5.110"BS it looks like I have room for the wheel to come inward another .750" which would add up to 5.860"BS for the new wheel. I need to have a 9" wheel in the front so I can now calculate the desired offset from this. So +22 offset is the highest you can use on a 9" wheel. Now since the desired wheel is 3" wider and only .750" of that width is being tucked inwards, that leaves the remaing 2.250" of width to extend outwards towards the fender. This may result in the tire sticking past the fender and requiring clearancing of the fender, a narrower tire, or possibly a rethinking of how wide a wheel you really need. and half of the width is 4". in this case the actual BS is 5.565" but .065" or 1.6mm. which is as close as your going to get and could be the result of your measuring accuracy as well as the fact that the wheel lip is somewhat tapered and difficult to measure so i use .5" as a rough guideline. hope this helps some of you . FC fitment guide... I found it helpful when picking wheels.